While the belief that we must have a protein-rich diet is permeating our society today, largely promulgated by the plethora of high-protein, carbohydrates-are-the-devil diets, it couldn’t be further from the truth, especially if you are seeking optimum health and wellness. In fact, even the USDA recommendations are far lower than one might expect. I was shocked when doing research for this article on their website www.usda.gov, at how low their recommendations were. Even I, a vegetarian since 1983 and vegan since 2007, was expecting to see their recommendations higher. 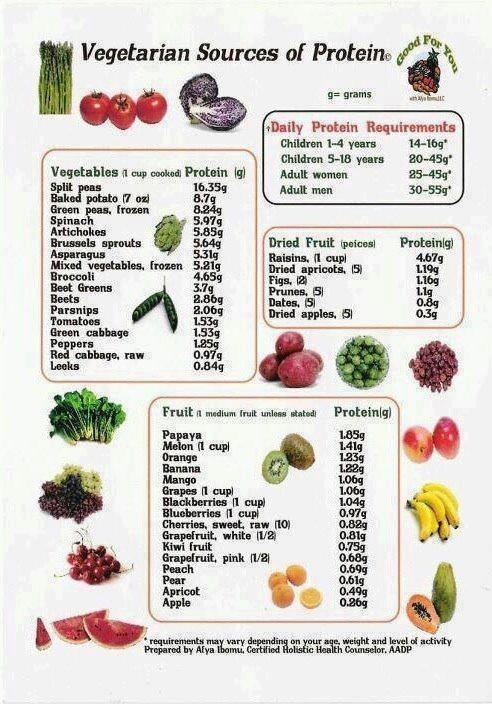 The Protein Recommendations chart below was directly downloaded from their website. Take a look! I have a suspicion that you, too, may be a bit (pleasantly) surprised. They further elaborate by stating in their Ounce-Equivalent of Protein Foods Table, that ½ ounce of nuts or seeds, 1 tablespoon of peanut butter or almond butter, ¼ cup of cooked beans, ¼ cook of cooked peas (such as chickpeas, lentils, or split peas), ¼ cup of baked beans or refried beans, ¼ cup or 2 ounces tofu, 1 ounce tempeh, and 2 tablespoons of hummus are examples of vegan food items that would equate to a one-ounce equivalent in the protein foods group. Doesn’t take much for us to get our protein from the obvious sources that we tend to think of as having protein. Astonishing! But wait, there’s more! As vegetarians, we consume quite a plethora of vegetables and fruit. Well, they don’t have protein in them, right? At least, that’s what we’ve pretty much been taught to believe as fact. FICTION!!! Using this formula, if you a female who is 5’5”, your recommended daily protein intake would be 45 grams(125# times .36 grams). 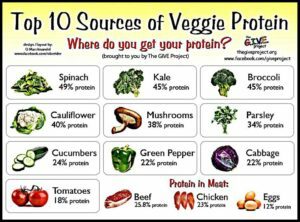 In looking at the charts included in this blog, you will quickly see how easy it is to ensure you consume an adequate amount of protein each and every day by simply eating a varied plant-based diet made up of vegetables, fruits, beans, legumes, and grain. In fact, I would go out on a limb and say that if you are eating such, you really don’t even have to give your protein consumption another thought. Well, that is, until the next person asks you, “Where do you get your protein?”. Now let’s get you armed with the pitfalls (real health hazards) of eating too much protein. According to the Physician’s Committee for Responsible Medicine (www.pcrm.org) , serious health complications that arise from too much protein include kidney disease, cancer, osteoporosis and kidney stones. Excess protein in the diet has also been associated with other significant health consequences—such as, obesity, diabetes, cholesterol (did you know that there is absolutely NO cholesterol in any plant-based foods…yes, that’s correct…NONE), high blood pressure. And, we haven’t even talked about factory-farmed animal products. Besides the abhorrent conditions that these animals (and let’s not forget about the fish) are raised in, they are fed inferior food which has a high-probability of being a genetically-modified food source (GMO) and not always what they would eat if left in their own natural world. To raise these sentient beings in the cramped, often dirty, definitely stressful environment that supports big business profits, they are pumped with antibiotics and growth hormones (so they can grow more quickly, get out of the farms, and onto one’s plate more quickly—ah, more big business profits). Did you know that a new practice of some factory farms is to now ship the livestock / chickens to another country, such as China, to slaughter the animals, then ship their carcasses back to the U.S. for consumption? Think about all the stress put upon these animals before slaughter and how much more medicinal intervention must be administered to these living creatures. Through cooking, not all the medications are cooked away. This is just me talking here…Makes me wonder if there is a connection between children developing physically more quickly and taller than historically as well as the fact that there is an antibiotic resistance that occurs. Allergies, ADHD, Autism Spectrum Disorders (including Asbergers and Rett’s Disorders) also jump into my conscious awareness. While I am not familiar with any studies linking these disorders to the residual chemicals/medications in animal flesh and organs, I would not at all be surprised if future studies reveal connections. With the magnitude of nutritious, colorful, and absolutely delectable plant-based food to choose from, not only is our food fuel for our bodies but it also provides pleasure to each of our senses. 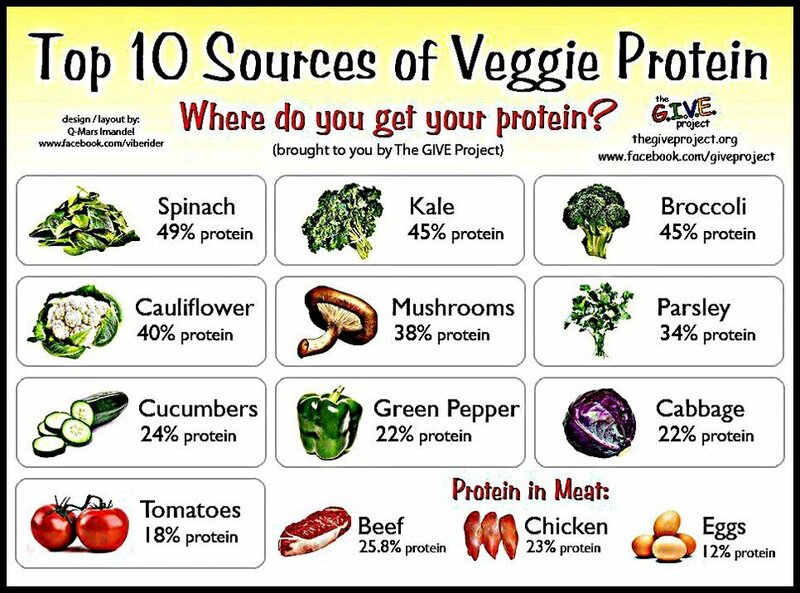 One Response to Where Do You Get Your Protein? Thank you for this information! Looking forward to your next article.